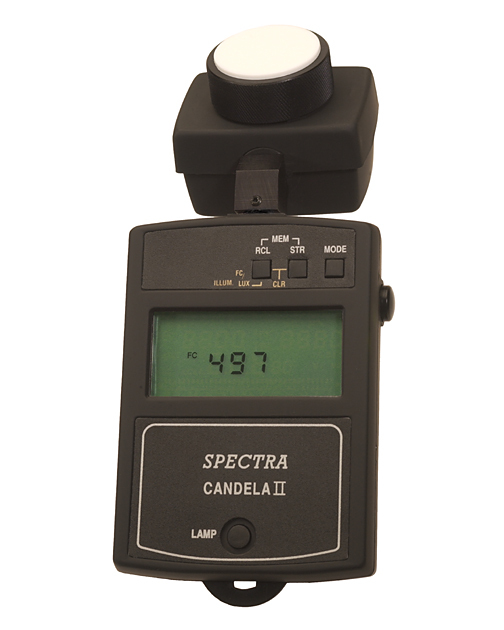 The compact digital Spectra CANDELA II Illuminance photometers provide an easy, economical means of making highly accurate measurement of indoor and outdoor light levels. The Spectra CANDELA II Model C-305 and CANDELA II-A Model C-310 are the most comprehensive, technologically advanced reliable illuminance photometers using advanced microcomputer technology, sealed hybrid integrated crocomputer technology, sealed hybrid integrated circuitry with large digsealed hybrid integrated circuitry with large digital back-lit liquid crystal display and memory function for high accuracy light measurement. The CANDELA II-A/ PHOTOSPOT SYSTEM 300 is in realty two complete photometric instruments in one. The system provides the capability of both luminance measurements from 0.1 to 70,000 footlamberts and illuminance measurement from 0.1 to 70,000 footcandles/lux. The Candela II-A can be purchased alone if illuminance is the only requirement.